France publishes a report on the state of the environment every four years. The report aims to inform the general public as to the situation of the different parts of the environment in France and to explain the pressures acting on these parts. The report is not intended to assess public policy or the actions resulting from public policy. The last edition of the report was published in December 2014. Since 1994, the amount of information available on the environment has increased and has become widely accessible to different stakeholders and members of the public. Given the abundance of information, and the fact that this information comes from multiple sources, the challenge is now to help the public to better understand the mechanisms at work in the environment. The 2014 report therefore provides a synoptic view of different elements of the environment such as biodiversity, pressures on natural resources, and exposure to hazards and nuisances. It then addresses societal responses to meet environmental challenges such as the decline in biodiversity, depletion of resources, or vulnerability of sub-national territories. These responses include changes in lifestyles and patterns of consumption, the greening of economic activities, and the reduction of environmental inequalities. Since the 1990s, the French economy has increasingly turned towards service activities rather than industrial ones. As a result, emissions of some pollutants – and consumption of natural resources within French territory – have decreased accordingly. The global economic crisis since 2008 has amplified this trend. The transfer of some industrial activities to other countries has led to an externalisation of certain environmental pressures: greenhouse gas emissions (Figure 1), consumption of natural resources, etc. Since the 1990s, coastal areas and major urban agglomerations have experienced an increase in the construction of housing and other infrastructure development due to their attractiveness as a living environment. This growth of urban areas has created a corresponding need for mobility. At the end of 2012, urbanised areas (areas containing housing, transport infrastructure, etc.) accounted for 9.1% of French territory. 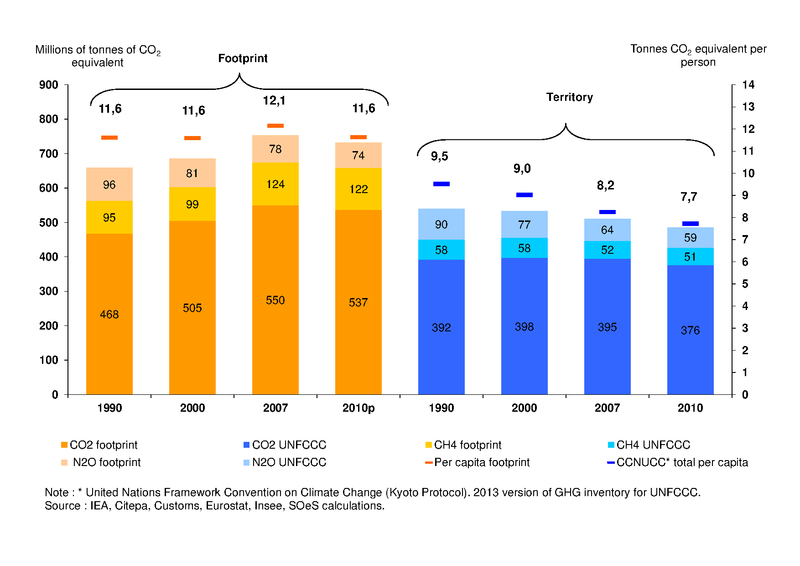 From 1990 to 2012, France reduced its greenhouse gas emissions by 13%. However, emissions from the transport sector (the sector with the greatest emissions) have not fallen in this time. Pollution from industrial facilities and urban-wastewater treatment plants has been reduced, but pollution from diffuse sources such as agriculture or transport has not fallen. Thus, phosphate levels in rivers have fallen by almost half since 1998, due to better urban-wastewater treatment and less use of phosphate-containing fertilisers. However, nitrate levels in rivers remain stable and are increasing in groundwater bodies. While air quality has improved on average by 20% from 1990 to 2012 (largely as a result of a decrease in sulphur dioxide emissions) the threshold levels for protection of public health for certain pollutants (ozone, fine particulates, and nitrogen dioxide) were exceeded at one measurement station in ten in 2012. Soils are subject to severe pressures, and are being degraded by erosion, sealing and pollution. To meet its needs, France calls heavily on natural resources, both from its own territory and in other countries. Since 1990, annual per-capita domestic material consumption has remained close to 14 tonnes, despite improved material productivity and the development of the repair industry. In fact, improvements in resource-efficiency achieved in manufacturing processes are offset by increasing demand. Taking account of unused domestic extraction (e.g. 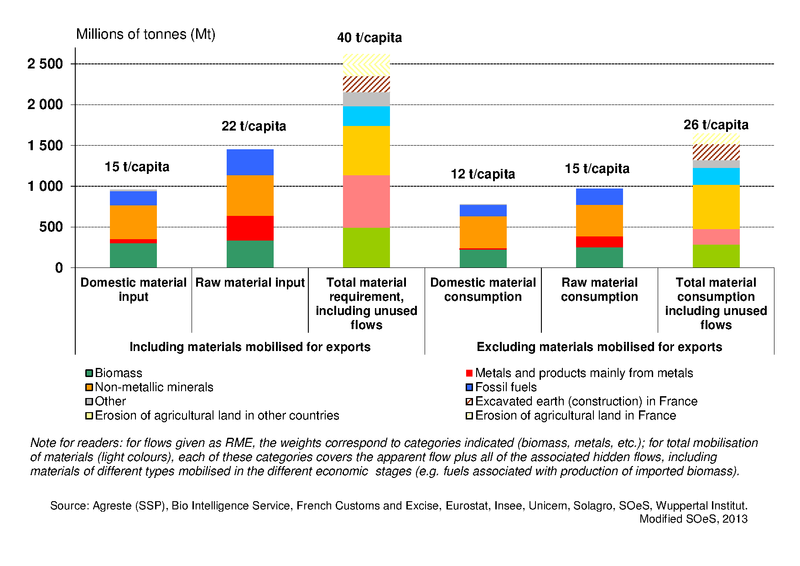 displaced materials, crop residues) and flows related to foreign trade, total per-capita consumption reaches 26 tonnes (Figure 2). Waste generation is slow to reduce, and has stayed at around 5.5 tonnes per inhabitant in 2010 (mostly waste from construction, building and public works). The quantities of municipal waste collected per inhabitant every year have increased by 25% since 1996, reaching 600 kg in 2011. On the positive side, the annual amount of household waste from which value is recovered (either by recycling or by using waste for biomass) has grown by 60% in the past ten years. Environmental contamination, destruction of natural areas, proliferation of invasive species and over-exploitation of resources all contribute to the decline in biodiversity. For instance, the numbers of specialist farmland birds have decreased by 35% since 1990. Numerous steps have been taken to restore the natural environment and to maintain ecosystems. The network of sites protected under Natura 2000 covered 12.6% of national territory in 2013, representing around 69 000 km². The proportion of protected marine areas in the waters under French jurisdiction went from 0.1% in 1980 to 2.4% in 2012. These actions, together with measures targeting species protection, have contributed to an improvement of the situation of some species previously threatened with disappearance (wolves, otters, beavers, etc.). Beyond the implementation of European environmental policies, France is attempting to bring about change in consumption and production patterns and to reduce environmental inequalities. Many national and territorial action plans are being implemented to reduce emissions of pollutants (pesticides, nitrates, etc.) into the water: the Ecophyto action plan and the introduction of nitrate vulnerable zones are leading to changes in agricultural practices. In 2012, organic farming accounted for 3.8% of the total agricultural area. In addition, wastewater treatment plants are being upgraded. The implementation of regional plans to protect the atmosphere in large cities has helped to improve air quality. Other changes in habits and practices are already perceptible. These include greater sales of appliances that help to conserve resources and energy; increased sales of lower-emission vehicles; greater development of public transport; and increased use of renewable energy. All of these changes are leading to a reduction in certain emissions of pollutants, better material and energy productivity and a reduction in waste generation. The public authorities are also moving to support the development of new environmentally-friendly businesses. Their actions have led to support for R&D, eco-innovation, and other strategic sectors. The promotion of environmental training is another lever for action that is contributing to more rapid integration of environmental concerns into the economy. Since 2004, the number of environment-related jobs has increased by 36%. In 2012 there were 447 500 such jobs, mainly in the areas of water, waste management and renewable energy. The numbers of students taking environment-related courses is constantly increasing. The French government is also seeking to reduce environmental inequalities. Remedial measures are being implemented in a variety of sectors (management of contaminated sites and soils, preservation of water resources intended for human consumption, noise abatement, and prevention of air pollution). Actions are also being developed by regional and local governments in areas such as adaptation to climate change, the prevention of natural and technological hazards, and the creation of "green" and "blue" conservation corridors. France's urban planning law promotes the sustainable development of sub-national territories in order to reconcile territorial development, environmental preservation and reductions in exposure to hazards and nuisances. "Green" city areas are also being developed along with dedicated-right-of-way transport infrastructure (notably for trams). The 2000s have seen the development of several tools to promote understanding of the French environment. Relevant and appropriate information is emerging such as the idea of the environmental footprint, which provides a clear illustration of pressures on the environment. For decision makers, research work into areas such as environmental health, unpaid ecological costs, and the evaluation of ecosystem services will provide support for the decision-making process. France's population and territory are highly exposed to natural and technological hazards, with some risks being exacerbated by climate change. Another issue is the exposure of the French population to nuisances such as chemicals present in the environment, electromagnetic waves, radioactivity, and noise, all of which could affect health. Lastly, in a context of national and international mobilisation around environmental issues (climate change, exposure to hazards, etc. ), environmental awareness among French people has increased. This is the case even though economic issues – always preponderant in a time of economic crisis – tend to be uppermost in their individual concerns.